The popularity of handheld devices has increased distracted driving problems on the road. Activities like texting, talking on the phone, reading, and watching a video take a driver’s attention away from the road and driving conditions. It is hazardous for the driver, passengers, and bystanders in the area. Drivers should use extreme caution when traveling near roadwork or utility roadside work zones. Pay attention when you see “Work Ahead” signs or orange cones that signal work activity ahead. Focus on potential hazards when driving after a storm – stay away from downed power poles, lines and electrical equipment. Motorists should never drive over a downed line, as snagging a line could pull down a pole or other equipment and cause other hazards. When drivers are distracted, there is a risk of an accident with a power pole, as they often line the sides of streets and highways. 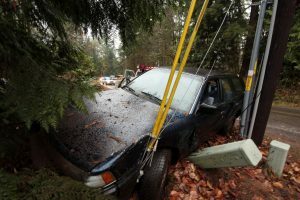 If you are involved in an auto accident with a power pole or you witness one, you must know the steps to take to keep yourself and others safe. In accidents with power poles, it is likely the pole and power lines will sag or may fall on your car or nearby, which would energize the area around your car with electricity. If you step out of the car, your body would become the path to ground for the electricity, which could be deadly. The safest place is nearly always inside the car. While downed lines can sometimes show they are live by arcing and sparking with electricity, this is not always the case. Power lines do not always show signs they are live but are just as lethal. Stay in the car if you are in a car accident with a power pole. Call 9-1-1 for help and wait until a professional from the electric utility tells you it is safe to leave the car. Warn those who try to come near your car to help that they must stay far away. Stay inside the vehicle unless there is fire or imminent risk of fire, which rarely happens. In that case, jump clear of the vehicle without touching it and the ground simultaneously. Then hop away with feet together. That way, there will not be a voltage difference between your feet, which would give electricity the chance to flow through your body, which could be deadly. Do not get out unless you must. If you witness a car collision with a power pole, do not approach the accident. By trying to help, you could put your own life at risk. The best thing to do is call 9-1-1, stay far away, and warn others to stay away from the accident.